Background: In order to improve the quality of care of chronically ill patients the traditional boundaries between primary and secondary care are questioned. To demolish these boundaries so-called ‘shared care’ projects have been initiated in which different ways of substitution of care are applied. When these projects end, disease management may offer a solution to expand the achieved co-operation between primary and secondary care. Objective: Answering the question: What key factors influence the development and implementation of shared care projects from a management perspective and how are they linked? Theory: The theoretical framework is based on the concept of the learning organisation. Design: Reference point is a multiple case study that finally becomes a single case study. Data are collected by means of triangulation. The studied cases concern two interrelated Dutch shared care projects for type 2 diabetic patients, that in the end proceed as one disease management project. Results: In these cases the predominant key-influencing factors appear to be the project management, commitment and local context, respectively. The factor project management directly links the latter two, albeit managing both appear prerequisites to its success. In practice this implies managing the factors' interdependency by the application of change strategies and tactics in a committed and skilful way. Conclusion: Project management, as the most important and active key factor, is advised to cope with the interrelationships of the influencing factors in a gradually more fundamental way by using strategies and tactics that enable learning processes. Then small-scale shared care projects may change into a disease management network at a large scale, which may yield the future blueprint to proceed. In the last ten years Dutch care providers have become interested in so-called ‘shared care’ for chronically ill patients. While the traditional scope of generalists and specialists has been primary care and secondary care respectively, their boundaries appear to constrain the patients' need of continuity of care to an increasing extent. This impedes the outcome of the professionals' efforts to attain good care delivery. However, self-interest is not the only drive. In addition, care providers have been motivated by several white papers about chronically ill [1, 2]. These papers mainly emphasise two reasons: quality assurance and efficiency. Clinical care, co-operation between providers, organisation and continuity of care, the attitude of providers and patient orientation in care delivery, need to be improved. Also, the growing number of chronically ill patients is requiring the Dutch government to find a balance between improvement of care and costs. Their white papers suggest that co-operation and substitution of care can be an effective way to deal with this issue. These drives and undoubtedly their interaction have yielded a lot of ‘shared care’ projects. Shared care is defined as the care in which generalists and specialists work together on the basis of agreements about co-operation, responsibilities and management . Traditional care, especially for chronically ill, is no longer applicable. Special projects entailing light forms of small-scale networks were considered an effective way to organise shared care . In a number of these projects a sort of substitution of care has been applied. Substitution of care can be established as a horizontal substitution—the transfer of care from the hospital to primary care-, and as a vertical substitution—transition of care from a higher to a lower qualified provider, often from a doctor to a specialised nurse . In particular specialised nurses have been introduced, initially with special tasks like education and advice, and later on as professionals with specific medical tasks and skills additional to their traditional nursing tasks. The idea is that they may play a central role in co-ordinating long-term care, executing medical routine tasks and are better skilled than doctors to educate and support patients and to promote compliance. The white papers also suggest that the tension between quality and costs may be further alleviated when usual shared care crystallises further as disease management. Disease management entails a special form of shared care. This type of management is characterised by the focus on one disease, client orientation and a broad scope of activities like prevention, diagnostics, treatment, counselling and rehabilitation . These aspects are often less explicit in common shared care, which is the most predominantly applied form so far in the Netherlands. Disease management is more robust than shared care, has greater impact and is applied on a larger scale. While development and implementation—experimental application of the developed concept—are often linked to usual shared care, dissemination—further application of the developed concept, possibly adapted on the basis of the experimental application, on a larger scale or elsewhere—requires more co-ordination, more structure and thus a heavier role of the management. Other aspects of disease management are quality assurance, transparency, benchmarking, feedback to caregivers and authorities and the use of information and communication systems. In the United States disease management occasionally applies to traditional health care providers [7, 8]. These providers can adopt the principles and practices while not giving up their independence or join public-private ventures [9, 10]. From experiences with both small and large-scale projects about shared care it has become obvious that failure of achievement of the strived for results is no exception. The accompanying change processes appear to be peppered with impediments and rather difficult to manage, due to divergent interests of a lot of stakeholders. Although the impact of the management factor is manifest, its influence has to be recognised and dealt with. Thereupon, different viewpoints can be considered like the perspective of the involved care providers or patients. However, to get a better grip on the key inhibiting factors and the pointed out lack of success, we want to stress the role of the management in this article. Therefore, we address the question: What key factors influence the development and implementation of shared care projects from a management perspective, and how are they linked? To answer this question we rely on the data of two related Dutch case studies, in which the concepts of shared care, substitution of care and disease management play a role. Below we will first address these case studies. Next the methodology and theoretical concepts are clarified, including the applied framework that originates from results of former innovation projects. After presentation of results as event descriptions and the analyses thereof, recommendations follow on behalf of successful project management on the line from common shared care to disease management. The two shared care projects were initiated in 1994 in the Maastricht-region and aimed at improving the quality of diabetes care without increasing costs, by introducing substitution according to regionally agreed protocols. The first project (A) involved the deployment of specialised diabetes nurses to take over the routine medical tasks of internists (vertical substitution) and to perform traditional nursing tasks during three-monthly patient consultations in the general practitioners' offices. The latter implied a transfer within the medical discipline from the internist in secondary care to the general practitioner in primary care (horizontal substitution). The specialised nurse acted as a co-ordinator of diabetes care for the target population containing type 2 diabetic patients being treated by the internist at the outpatient clinic, who labelled them as medically stable. This nurse became the patients' focal point. In the case of an emergency outside working hours the patients could consult the general practitioner, which ultimately remained the person responsible for the care of these patients. Once a year they visited the internist at the outpatient clinic for a medical check-up. In total 74 patients, 22 general practitioners and 7 internists-endocrinologists participated in this project (Diagram 1). The second project (B) comprised the shared consultation by internists and general practitioners in primary care (horizontal substitution). The focus was on the recurrent education of general practitioners and the prevention of unjustified referrals. Periodically shared consultation hours were conducted in the general practitioner's office. During these consultation hours an internist and a general practitioner saw patients with type 2 diabetes mellitus together. The latter person remained responsible for the care of these patients. In total 250 patients, 25 general practitioners and 5 internists participated in this project (Diagram 2). recurrent education of all care providers. A general practitioner and an internist were responsible for the projects A and B respectively. In practice this implied that each project followed its own routine. However, to improve co-operation between both projects and to settle policy matters, additionally a small common policy-group was installed that comprised the project managers and other key stakeholders. These stakeholders were a member of the regional association of general practitioners in the Maastricht-region—speaking as a private person-, a representative of both the University Hospital Maastricht, the ‘Green Cross’ home care agency in the Maastricht-region, the Co-ordination Centre for the Chronically Ill Limburg, Synchron, and the Diagnostic Co-ordinating Centre University Hospital Maastricht. After the merger into one disease management project the two project managers bore the ultimate responsibility together. Background information about both cases on rather formal lines is described in Appendix 1 for the period 1994 until 2000, supplemented by information about the project structure during this period (Figures 1 and 2). The case study method by Yin  was applied, i.e. an initially multiple case study design altered into an embedded single case and finally changed into a single case design, or more concrete: the separate projects A and B got intertwined and became a disease management project. The intended course of action of two cases was enforced to alter into one embedded case, which actually contained two gradually interrelated cases and ended up in one case. Data were gathered periodically by means of triangulation. Data triangulation implies the collection of information from multiple data sources to corroborate the same facts or phenomena. Data sources included the use of in-depth interviews with participants, written questionnaires sent to several involved care providers, observations of project meetings, and documents next to reports . Inherent to the case study method is the application of a general and a specific strategy to analyse the case(s) . In this study the general analytic strategy involved a framework for organising data, in which elements of the theoretical concept of the learning organisation are embedded (Figure 3). The framework implies an adapted model of critical influencing factors , originally developed on the basis of gathered empirical evidence by the evaluation of innovation projects in the early nineties . While the original model mainly focuses on the influencing factors as such, the adapted model also makes explicit their interrelationships. The influencing factors can be either external or internal. Both can have a promoting and inhibiting impact. The external factors are factors outside the environment of the project activities. They entail the role of authorities—like the government and health insurers-, legislation and societal developments. Internal factors are factors that determine change processes within the project activities. Encompassed is a factor involving the local context—including culture, power and structure-, as well as factors about commitment and change management. The latter concerns goal-oriented steering of change processes by the management of the innovative (project) activities, mainly the project management. The steering entails the application of change strategies and tactics. In respect to the interrelationships between the factors the adapted model considers that stakeholders learn from experience. Therefore, the concept of a learning organisation is taken as a reference point. The concept implies the promotion of learning processes on individual and organisational or system level, in which experimenting, observing, coping and learning from mistakes are accepted and encouraged [13, 14]. These learning processes need to attain at least the level of so-called double loop learning [13, 15–17]. This means getting new insights from experiences, which imply calling into question and possibly redefining the rules about ‘right’ and ‘wrong’ that have been adhered to, or ‘doing the right things’ . Double loop learning can change fundamental assumptions about the organisation. The consequence may be redefining the organisation's goals, norms, policies, procedures, or structures. This kind of radical learning “calls into question the nature of the course plotted and the feedback loops to maintain that course” . According to Argyris , double loop learning is manifest “when mismatches are corrected by first examining and altering the governing variables and then the actions”. These variables are the ones that drive and guide such actions and can be deduced by observation. On the one hand this type of learning can be distinguished from the basic level, termed single loop learning, which actually occurs when a match is created between the organisation's design for action and the outcome, or when a mismatch is detected and corrected by alteration of the action. On the other it underlies “the ability of organisations to learn about the contexts of their learning” , labelled meta-learning, meaning when and how they (do not) learn and adapt accordingly [13, 17]. The learning component is depicted as a number of curved lines, which connect the discerned key-influencing factors (Figure 3). It is supposed that the external factors influence the internal factors top-down in a one-way direction. The link between the internal factors, i.e. local context, commitment and change management, may take the shape of a learning cycle, triggered off by a learning impulse from the local context. This comprises a learning loop from the factor local context to the factor commitment, change management and local context, respectively. However, this can cause the same learning loop backwards, by which the learning cycle is completed. Altogether, the internal factors are considered of decisive importance. An attempt has been undertaken to approach the dynamic complexity of reality more closely . It was expected that the findings of the case studies A and B would confirm the adapted model. In addition to the general strategy the specific analytic strategy of explanation building was partially used . The strategy of explanation building entails the gradual building of an explanation of the studied phenomenon, implying the stipulation of a set of causal links. In the case studies A and B this entails the key—influencing factors and their links as shown (Figure 3). The result is a cross-case analysis, next to an analysis of each (embedded) case. These analyses mostly occur in narrative form . In this paper, event descriptions were used. They allow studying interactions during a sequence of events or one event [18, 19]. On that account at first a brief case history of both cases was described on the basis of the gathered data sources (Appendix 1). Then the events were carefully selected and analysed. In our view this is an indispensable point of departure for further systematic data analyses to be conducted. In-depth interviews were carried out with several persons, from one up to four times (Table 1). Questionnaires (28) were filled in once by the two specialised diabetes nurses (response 100%) of project A, besides 21 general practitioners (response 84%) and 5 internists (response 100%) of project B. In addition, observation was performed of formal meetings of different groups of projects A and B. Furthermore, documents and reports of participating organisations and project management were gathered, like protocols, minutes, (news) letters, brochures, policy pieces, despatches and annual reports. The event descriptions that derived from the cases' history (Appendix 1), are presented below. Following each description the enclosed key—influencing factors and their linkage will be analysed. Afterwards the findings will be summarised. To participate in projects A and B the regional association of general practitioners claimed that only if these projects were presented to the outer world as one package would they co-operate and give their support. The other participants accepted this demonstration of power (local context) because co-operation of the general practitioners was vital (commitment). Moreover, this policy was maintained throughout the course of the projects. Subsequently the policy-group in charge of both projects (project management) set up a protocol group to develop the necessary protocols for both projects. Although several providers questioned this joint enterprise they did not withdraw. With a substantial helping hand by the project management the protocols were developed and agreed upon within the pre-set term of several months. However, the consequence of working under considerable pressure of time was that not all participants, among which general practitioners felt equally involved (commitment). Therefore, the policy-group (project management) initiated a second post-graduate course for general practitioners in the particular region in which the projects and new developments were further amplified and the internist, general practitioner, specialised nurse, staffnurse and dietician played a role. Once again the course met substantial appreciation. Thereby an extra impulse was given to alter the traditional culture (local context), that performing medical tasks was only the domain of doctors. Subsequently interest increased. The number of general practitioners that finally signed up for the projects was beyond expectation but not equally divided (commitment). Encouraged by the policy-group (project management) the general practitioners' regional association achieved a more balanced grade of participation by mediation (commitment). Consequently especially the attitude of providing organisations and providers changed vice versa (local context). Although the factor commitment seemed considerably influenced by the factor local context, i.e. power and culture, straight changes were directed by the project management. This management interpreted every circumstance and relevant alteration within and decided what change strategies and tactics needed to be carried out to bring about the required changes. By the consequent actions, commitment also influenced the local context. Therefore, the description supported the argument that the project management was the most powerful active influencing factor in the development of projects A and B. Yet the outset of the projects seemed to be conditioned by the local context and commitment, while the latter prevailed. In the narrative two learning loops can be perceived between the internal factors. Both start and come to an end at the local context as depicted in the adapted model (Figure 3). In addition, either one is also expanded with a backward in-between loop from the project management to commitment. Finally, when the so-called ‘temptation’ strategies and the tactics of the project management yielded a balance in commitment and a necessary change in power and culture (local context), the start of the project became feasible. The strategy, implying the short-term aim to get started, appeared to be related to the choice of the tactics. For both projects A and B these entailed going around together, settling a joint protocol group for protocol development, organising a second post-graduate course for general practitioners and other disciplines, next to mediation. This seems to imply that the basic linkage of the influencing internal factors in the adapted model (Figure 3) is confirmed, and that the driving force of the project management induced the linkage. Application of a change strategy and related tactics appeared to be one reason. The way these were carried out another. The narrative indicates that the project management possessed skills to steer towards the intended outcome. The acquired level of learning tends towards double loop learning. The prerequisites to get started with the shared care projects were understood by the project management, which required rethinking the used tactics and changing policy accordingly. Initially the news of the existence of project B surprised the project management of project A. The policy-group (project management) of these projects was set up once this management considered project B as competitive and acted accordingly. The reason was that both looked for participation of general practitioners in the same region and the design of project B was familiar to general practitioners, while the design of project A was rather unfamiliar to them. The policy-group asked the project managers to pay attention to their interrelationship. All involved persons got to know each other better and the management of project A recognised and appraised the support of the management of project B. Finally, the shared insight that both needed each other to continue, yielded discussion about integration of both projects into a disease management project. In mutual co-operation they launched its development during meetings with potential participants (commitment). This implied coping once more with the traditional domain of tasks reserved to doctors (culture and structure) and the power of various players in the field like physicians and the local insurer (power). The pressure of the general practitioners to merge the projects A and B (event description 1) urged the management of projects A and B to co-operate. The account showed that the project managers became rather preoccupied with settling their interrelationship during the projects' development and implementation. Only after mutual commitment was firmly established, they succeeded in focusing on the necessary conditions for the disease management project. The project management was obliged to co-operate and stick together to bring about the necessary changes in commitment and local context to enable the merger. Again commitment turned out to be an absolute precondition to move ahead. However, also the local context kept drawing attention. The description reveals a backward in-between learning loop from the change management to commitment and the local context (Figure 3). The factors seem to have got linked because of a change in strategy of the project management. The short-term aim ‘get started’ followed by ‘make progress’, gradually altered in the long-term aim ‘continue in the long run’. Analogously the applied tactics changed from competitive behaviour, to appraisal and finally co-operation. Although this sequence especially appealed to the project management of project A, not until all persons involved in the project management of both projects applied tactics towards mutual co-operation, could the merger be properly addressed. This brought along organising meetings to create support by the broad network of potential participants (commitment) and rearrangements in the local context. The attainment of a reversal in policy from competition to co-operation and eventually integration can be classified as double loop learning. Acquisition of the understanding that both projects could not survive without each other and afterwards proactively propagating the merger of the two otherwise appears out of the question. Within project A the facility to keep professional knowledge and expertise of the specialised nurses up-to-date was not arranged for (local context). Taking care of appropriate training of these professionals and other involved providers was considered important [20, 21]. The issue was raised repeatedly by the specialised nurses and discussed (commitment). The management responded that their knowledge and expertise met the task requirements in respect to patients included in the project and took no action (project management). About a year later general practitioners were referring patients to the nurses not belonging to the target population to an increasing extent (local context). Then the issue of professional knowledge and expertise was again brought forward by them and discussed followed by management plans to monitor the nurses for this additional group of patients by internists-endocrinologists from the outpatients' clinic (project management). However, the priority of the specialised nurses to take additional courses about co-morbidity to further increase their task performance (commitment), was appraised differently by the project management. The management told them that such courses were not yet available and the budget of the project left no financial room (project management). In the final phase of the project, when it became apparent that projects A and B would merge into one disease management project with all diabetic patients as target population, the project management revealed that the extension with the group of patients in the general practitioners' offices was expected and borne in mind from the beginning although the request of the general practitioners to enable this possibility was posed (a lot) sooner. Because of research purposes too many changes were intentionally avoided, especially in the first year of the project. From the second year on this possibility was planned for and agreed upon. The problem was that the nurses got caught up somewhat in the middle between the aim of the project and the goals of the general practitioners. It was considered quite obvious that further training was necessary in accordance with the ambition of the specialised diabetes nurses and training for newcomers to the business. This training ought to be developed for which the initiative thereupon was taken. However, the linkage between the question of the nurses for further education and the pressure to treat patients not included in project A was not looked at as a matter-of-course (project management). The project management dominated the scene and its change. Apparently, in spite of the efforts of the specialised diabetes nurses, the importance of the local context and commitment was recognised and acted upon by the project management according to a long-term strategy. The account shows a complete learning loop from and to the factor local context, as well as a partial backward learning loop from the local context to the factor commitment. Next an in-between loop from commitment to the change management can be noticed (Figure 3). During the first two episodes the nurses linked the lack of an appropriate training facility (structure) with their need of further education on co-morbidity in particular (commitment). Probably their experiences with the group of patients outside project A boosted this need, which they wanted to fulfil instantly to better live up to expectations. They try to put the project management under pressure. In the second episode the project management partly met the nurses' request but stuck to the project's protocol, the required expertise for the target group, and the available financial means. Carrying out the agreed upon protocol was and remained their main task. This may be called a practical solution valid for the short-term. In the third episode it became clear that the target group would be enlarged on behalf of the disease management project, which outcome did the project management plan for. Next the followed strategy and tactic of the ‘hidden agenda’ were made explicit. At that time a fundamental solution was worked out for the education problem of the specialised diabetes nurses from a long-term perspective. This implied training considering all aspects of the position of the specialised diabetes nurse. The chosen solution tends to underpin the assumption of double loop learning by the project management, except for apparently confining the conversation with the nurses to discussion. The management of projects A and B often tried to solve barriers by organising meetings in which discussion took place but scarcely dialogue (project management). Although at first this was taken for granted, gradually it turned out that this was not the favoured policy by a number of providers and patient representatives. In particular in the final phase of the project more dialogue was evoked by the participants, implying group conversations enabling the discovery of insights that might not be attainable by its members thinking on their own (commitment). By degrees the management put more emphasis on developing collaborative interdependent relationships within teams, in which the application of dialogue was a precondition (project management) . Providers and patient representatives gradually questioned the usual practice of the project management to discuss matters. When the shared care projects headed towards one disease management project they provoked more dialogue. The project management recognised this practice and its impact on the future commitment. Consequently the tactic was changed towards working as a team in which dialogue happened to be common. The narrative reveals an in-between loop from the project management to commitment and vice versa. The different views of the project management and the participants slowly converged. This was possible because the project management learned from the mistake to side-step dialogue too much during formal meetings, which implied unlearning this previously established way of communication. The awareness of the project management grew that in order to sustain commitment in the long run, building in team elements were necessary. The result indicates double loop learning with regard to the participants as well as the project management. The Association of Dutch Health Insurers published a brochure according to which they considered disease management as an opportunity to get control of the management of providers in healthcare  (role of insurers). This external factor was judged by the project management to give an impulse to changing the power relationships in projects A and B (local context), meaning also a chance to gradually change the involvement of the local insurer from rather distant to involved (commitment). Therefore, the project management started negotiating with the insurer about financial support to secure the dissemination phase, acting prudently and with authority. Also, the top management of key stakeholders, like the hospital and home care agency, was approached likewise about the matter (project management). The outcome, to take shared and financial responsibility for this phase, enhanced support by all participants, including the patient organisation, to continue designing the most suitable integrative project on a large scale. This also entailed more central co-ordination, structure and obligations than in the shared care projects so far, and a computerised exchange of information by providers (commitment). Thereby also existing power relations changed in a more co-operative direction (local context). The project management took advantage of a favourable external circumstance related to the potential role of health insurers around disease management and anticipated what was coming. The long-term aim and consequent strategy to settle the necessary conditions for the dissemination phase seemed to be the guideline. These conditions belonged to the factors local context and commitment. Finally, the applied tactics and its skilful performance proved to be successful. The exemplification appears to entail evidence about the one-way link between the role of the insurers at national level and the regional insurer in the local context, thereby initiating a learning loop towards the change management and then backwards again to the local context (Figure 3). In charge was the project management, who aimed at a fundamental solution for the issue of shared, also financial, responsibility. The focus was no longer on a short-term strategy. The project management demonstrates double loop learning in order to achieve the necessary strong shared responsibility by the participants (commitment) and advantageous power relationships (local context) for the next phase of projects A and B. Tactics such as using an external promoting factor, negotiation and involvement of the top management of key stakeholders, turned out to be effective. Supposedly this was also due to the personal communication skills of the project management and the attained insight of ‘doing the right things’ by key stakeholders. Looking back at the event descriptions at the level of analysis across cases and the level of each single (embedded) case, evidence is found for the adapted model (Figure 3), the discerned key-influencing factors and the depicted linkage between them. The evidence especially regards the internal key factors change management, i.e. project management, commitment and local context, which is also their most likely order. The first factor seems responsible for actively linking the factors, while the latter two appear prerequisites for the project management to enable successful application of short-term and long-term strategies and tactics. However, the extent of success of their application apparently also depends on double loop learning and noticeable intentions, charisma and skilful communication by the persons in charge. It is indicated that long-term strategies and tactics are the most effective, especially in case all participants attain the level of double loop learning. Furthermore, the evidence shows the occurrence of backward in-between learning loops, mainly between the factors change management and commitment. Besides not in every circumstance the whole learning cycle is completed. Obviously the details of the adapted model depend on the particular circumstance. This implies that the applied framework is founded as a basic design, which needs to allow for abbreviations and partial extensions. deal with the question how to become a learning organisation, which not only guarantees individual learning (event descriptions 1–5), but also organisational or collective learning (event descriptions 4 and 5). Further confirmation for these hints can be found in refs. [4, 13, 14, 17, 24–31]. However, to keep up with a rate of change that leads to a dynamic equilibrium , is rather difficult. Therefore, we plead for further investigation of the complexity of reality, in which continuous change has to be coped with, on the basis of the presented model (Figure 3). In our view this effort should not only take the management perspective as a reference point, but also the view of care providers and patients. Moreover, application of the concept of the learning organisation linked to the factor change management in full, demands study in-depth. Finally, researchers have to face the fact that the complexity of change processes within projects may imply, that the chosen case study design beforehand cannot be dealt with as a straitjacket. The event descriptions of our case studies have made it possible to look upon the key-influencing factors of the development and implementation of shared care projects, and their linkage, from a management perspective. The accounts demonstrated change processes involved in starting and implementing shared care projects at a small scale, that afterwards turn into one disease management project at a large scale. 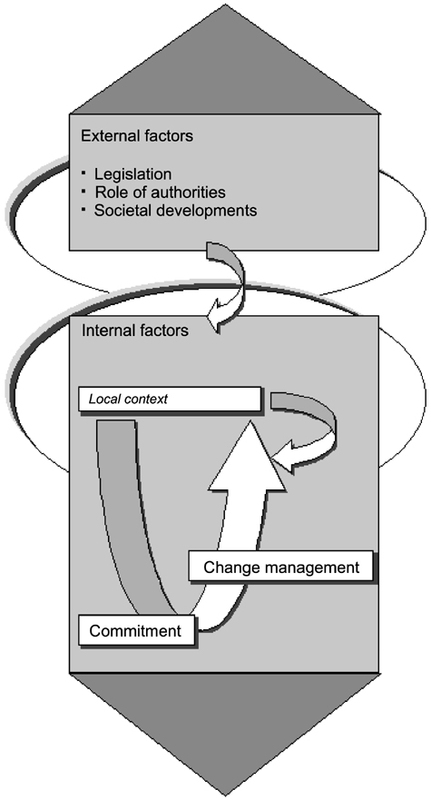 These change processes were dominated by the promoting and inhibiting influence of the key factors project management, commitment and local context, and their linkage (Figure 3). Mainly the project management appeared to be largely responsible for this linkage. The successful outcome of the processes in the end was particularly due to the adequate and active use of change strategies and tactics. While at first short-term solutions seemed to be sufficient to solve problems, the more progress was made towards disease management, the more the circumstances urged the project management for long-term strategies and accompanying tactics. The factors commitment and local context, which acted as prerequisites, required an analogue change. This consecutively meant increasingly firmer, more obligatory commitments and gradually more solid changes in the local context. In general this implies that the project management can be considered as the most important key-influencing factor in change processes of shared care activities. In our opinion the hints given on the basis of the analysis of the event descriptions should be applied widely. We stress that all key factors and their interrelationships need to exhibit a dimension of growing obligatory intensity. To achieve this, project managers are recommended to position learning as a core characteristic of the project organisation and to fully exploit the key factor change management. Active, stringent shared responsibility by all participants in a disease management network, triggered by strategies and tactics towards fundamental change, may be the new imperative to succeed. This will further challenge the personal commitment and communication skills of the persons in charge. Along these lines the end goal of a blueprint ‘shared care for chronically ill’ to balance out quality and costs, as suggested by the white papers [1, 2] we started with, may come available. We thank Mr. John Pantall of the Health Services Management Unit of the University of Manchester, for his helpful comments. Funding has been provided by the Advisory Group Stimulating Programme Health Care Research (SGO), the National Committee on Chronically Ill (NCCZ), (Department of internal medicine) University Hospital Maastricht, Co-ordination Centre on the Chronically Ill Limburg (Synchron), (Department of Health Organisation, Policy and Economics) University of Maastricht and the Institute for Rehabilitation Research (iRv). 1994 The University Hospital Maastricht appointed a professor on integrated care for thechronically ill, who was located at the Diagnostic Co-ordinating Centre and organisedmeetings with persons working in the field of care delivery for the chronically ill, to listthe problems in this area as well as ideas to improve this care. About half a year laterhis inaugural lecture on integration of primary and secondary medical care forchronically ill patients took place. Horizontal and vertical substitution was suggested, to enable tailored care for chronically ill patients. 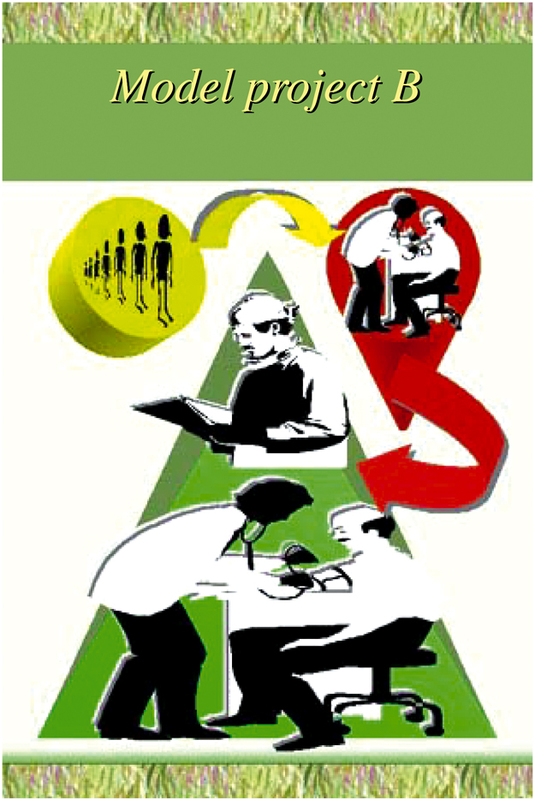 In congruence with the findings of his fieldwork and the position of the key players like the hospital, the regional associationof general practitioners and the home care agency, he decided to prepare for ageneral project on care networks consisting of several interrelated projects, amongwhich project A. Soon thereafter also a fellow research worker was employed. In the meanwhile the Co-ordination Centre for the Chronically Ill in the province ofLimburg, Synchron, carried through an analysis of the bottlenecks in the care delivery to chronically ill patients in this province. For each discerned patient category a committee was installed, to work out projects to solve those bottlenecks. Following the diabetes committee, in which an internist-endocrinologist (hospital), a general practitioner (general practitioners' association), a staff nurse (home care agency), a researcher (university), a patient representative (diabetes union) and staff members (Synchron) participated, a plan was drawn up on behalf of the improvement of the care delivery to patients with diabetes mellitus type 2. This plan entailed a number of coherent projects, including the outline of project B. 1995 A fellow research worker conducted interviews with a number of chronically ill patients about bottlenecks in the continuity of care and ideas about their elimination in the Maastricht-region. Afterwards the professor and the fellow worker organised an invitational meeting about shared care to the chronically ill on behalf of the key persons working in this field. Next both wrote an article about starting a small-scale project within a network configuration, in which the specialised nurse would take over tasks from a physician, according to a multidisciplinary protocol. The preferred central co-ordination should be taken care of by a flexible, already operational organisation. Individual meetings with all participants of the invitational meeting were organised, to establish priorities and arrange promises about contributions. Then the professor agreed with the key players who should be involved in the development and implementation of project A in the Maastricht-region, and that the Diagnostic Co-ordinating Centre should carry out the central co-ordination task. The agreement was accompanied by the warrant that tuning of activities in respect to other similar projects in the field of chronically ill patients in the region would be taken care of. This also regarded activities of the Co-ordination Centre. In addition, decisions were made about the necessary consultative bodies, including an advisory committee with representatives of relevant national organisations. The Co-ordination Centre would take the initiative to start a protocol group to develop the necessary protocol; the Diagnostic Co-ordinating Centre would arrange for a formal contract between the key stakeholders about the terms of co-operation agreed upon. A project and research proposal was rounded off and the professor acquired the necessary financial means from national umbrella organisations and regional stakeholders like the hospital, home care agency and the Co-ordination Centre. It was decided upon to start with project A for the benefit of diabetic patients. Finally, the project management, e.g. the professor as project manager and the fellow worker after being appointed as project co-ordinator, became aware of the presence of project B by its description in the Co-ordination Centre's plan. Since both Centres relied on the participation of the general practitioners in the same region, they decided to install a common policy-group to accomplish gearing of activities to one another and joint settling of policy matters. This policy-group consisted of key stakeholders next to the project management. 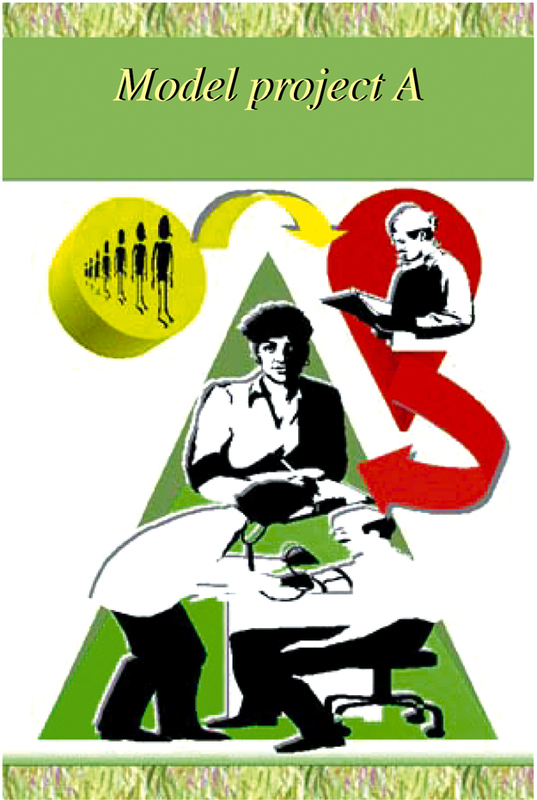 Preceding and during the development of project B the Co-ordination Centre focused on a project about training general practitioners to enhance their knowledge about the medical treatment of diabetes mellitus type 2 and multidisciplinary co-operation between care providers in primary and secondary care. In co-operation with the regional association of general practitioners in the Maastricht-region, the study group of training general practitioners in this region and the county general practitioners' union Limburg, the first acknowledged post-graduate course within this project was developed and carried out in the Maastricht-region. During the programme the ideas about both projects B (initiative Co-ordination Centre) and A (initiative Diagnostic Co-ordinating Centre), were presented as well as their preconditions. Agreements were reached about their development and participation herein by general practitioners. Then the regional association of general practitioners requested to present both projects A and B to the outer world as one project of the hospital, the home care agency, the two Centres and this association together. Otherwise they would not join. The policy-group decided to meet this request and to periodically report to the diabetes committee of the Co-ordination Centre, that guided the Centre's diabetes' plan. According to the prescribed procedure common in the region, the policy-group presented the combined plan of both projects to a regional steering group of integrated care. After consent of the initiative the regional association sent the[hm4p] combined project to the individual general practitioners and asked them to sign up for either project A or B. 1996 A project manager, i.e. internist-endocrinologist, was assigned for project B and the (diabetes committee of the) Co-ordination Centre reached an agreement about availability of personnel of the endocrinology section of the hospital on behalf of project B. Project A organised a meeting to inform the participating general practitioners more in detail about its content. Subsequently, on behalf of the policy-group, the Co-ordination Centre, in co-operation with the Diagnostic Centre, installed a protocol group to develop the necessary protocols, e.g. one for project A and one for project B. Apart from care providers also participation of the regional diabetes union was arranged for. For the execution of each protocol a subgroup was formed. Following the protocols' development the protocol group decided on its content, which after some adjustments by the policy-group, and approval by the medical ethical committee of the hospital, were published. Then project A started the recruitment of patients at the outpatient clinic. Due to strong inclusion criteria the target population turned out to be very limited. After discussion the criteria were enlarged. However, the finally selected target population remained smaller than expected. The home care agency and the hospital disagreed about the recruitment of the specialised diabetes nurses on behalf of project A. Both organisations wanted their nurses to be employed. Finally, two nurses were employed by the hospital and another arrangement regarding the other interrelated projects was made to accommodate the home care agency. On account of project B it was arranged for that several internists would visit once a week the participating general practitioners' offices to carry out the consultancy-hours together with the general practitioners. The protocol group was disbanded and the contribution by participants financially settled. Foregoing the implementation phase the Co-ordination Centre took the lead in organising a second certified post-graduate course. Furthermore extra training for the specialised diabetes nurses was considered an issue which needed further attention, as well as the nurses' attainability and reimbursement of expenses. 1997 The implementation phase of both projects A and B started. The nurses introduced themselves to the participating general practitioners. It was announced that except from the target population also the nurses, on what account criteria would be developed, could see other patients. The regional inspection of health care, member of the advisory committee, subscribed to the protocol, thus allowing the aimed for vertical substitution without taking additional legal measures. Finally, the key stakeholders signed a formal contract of co-operation. In project B, the researchers who visited each individual participant explained the practical procedure that would be followed. The name of the Diagnostic Co-ordinating Centre was changed into Transmural and Diagnostic Centre. On this occasion the Diagnostic Centre organised a symposium on innovative care and left out project B, about which circumstance correspondence was undertaken by the policy-group. However, this group did not function too well because of regular absence of one of the project managers. It was settled that the frequency of its meetings would drop. Instead both project managers would meet every month and report back to the policy-group. It was also arranged that the periodically published newsletter about project A henceforth would be replaced by a collective newsletter containing information about the progress of projects A and B. Extra measures were taken by the internists to promote the selection of patients on behalf of project A. It turned out that some of the internists showed reluctance about the patients' inclusion, which issue was talked over and dealt with. Once again the problem was discussed about general practitioners that also wanted to consult the specialised diabetes nurse for other diabetic patients then those who belonged to the project's target group. The nurses started seeing those patients. Again the issue of extra training for the specialised nurses was mentioned but not acted upon. In addition, the nurses experienced a patient registration problem that endured. It regarded the efficiency and time consuming nature of this activity. Until autumn new patients were selected for project A. A meeting was organised by the Co-ordination Centre in co-operation with the Diagnostic Centre for all the participants of projects A and B to evaluate their experiences with the implementation of both projects so far. One of the project managers put forward the idea about integration of the two projects in the near future. Consequently the bottleneck of seeing diabetic patients by the specialised nurses, who did not belong to the target group, was discussed again. The use of a transfer form by the internist to inform the specialised nurse after the yearly check-up was settled. Afterwards the project management of project B wanted to settle certification of the shared care model. Then the policy-group agreed upon a combined application with project B, in which the Co-ordination Centre took the lead. 1998 The study group of training general practitioners in the Maastricht-region granted the application for certification of both shared care models. Also, a financial agreement for participation of general practitioners in project A was arranged for with the regional association of general practitioners. A continuing-education course was organised by both projects A and B on behalf of the participating assistants of general practitioners, which was certified by the Dutch union of general practitioners' assistants. Some practical problems about the yearly check-up of patients with the internist at the outpatient clinic in project A were solved. Again the procedure was discussed to enable the specialised diabetes nurses to see also diabetic patients not included in the target population during the consultancy-hour in the general practitioner's office on a larger scale. This circumstance was particularly allowed for from the second year of the implementation phase, under the announcement: “You have to take care that you will not sit on the chair of the general practitioner or the specialist”. Once more the issue of extra training was raised. The management planned that questions could be addressed to the internists-endocrinologists at the outpatient clinic. The future of the projects, including ideas about elaboration, became a subject for debate. An attempt was made to assign projects A and B, in combination with other regional projects, as a national project to enhance further the structuralisation of the care delivery for diabetic patients. The policy-group decided to adapt the protocols as soon as more clarity was available about the dissemination phase. Since during the implementation of both projects A and B dealing with foot problems of diabetic patients appeared to be a genuine problem, the third certified education programme was organised on behalf of the participating general practitioners. On the basis of several meetings with participants a proposal was drawn up about a regional network in shared diabetes care. This was discussed at a meeting about dissemination of project A, which was organised by the Diagnostic Centre. Following meetings, in which more attention was paid to dialogue, resulted in further proposals about a disease management approach, including the finance of specialised nurses. Later on an implementation committee was installed that combined all proposals. The outcome was that both projects A and B should be integrated within a disease management model. 1999 So as to be informed about patients' experiences during the implementation phase, patient focus groups were conducted. To meet the request of the specialised nurses to take additional courses, the initiative was taken to develop an appropriate Higher Vocational Educational-training, also for newcomers. In the meanwhile the aforementioned proposal was submitted for national subsidy. Furthermore meetings were set up with key players like the insurance company, hospital and home care agency to accomplish further financial agreements about the employment of the necessary capacity of specialised diabetes nurses and overhead expenditures. As a result of a positive reaction, the proposal was elaborated and meetings with the top management of key players were continued. In addition, a new protocol was developed by all involved and potential participants, including the patient organisation, implying the integration of the protocols of projects A and B and the incorporation of new developments in the treatment and counselling of diabetic patients. Also, an agreement was achieved to exploit an electronic diabetes management system to enable multidisciplinary registration. Finally, the national subsidy was granted and the financial involvement of a number of key players, i.e. the health insurer, hospital and home care agency, was attained. Then the proposed regional disease management model on diabetes care was introduced during a conference organised for all participants in the Maastricht-region, and other persons in the province of Limburg interested in the topic. It was agreed upon that the two project managers of projects A and B would conduct joint management and that a general project co-ordinator would be appointed next to a medical co-ordinator. In the end, the management started to visit groups of general practitioners to make practical arrangements for the dissemination phase. Ministry of Welfare, Health and Culture. Chronisch-ziekenbeleid. Chronische patiënten niet buiten spel (Policy on chronically ill. No offside for chronically ill patients) Gravenhage: Sdu Publisher's Plantijnstraat; 1991. Ministry of Welfare, Health and Culture-Committee Modernising Curative Care. Gedeelde zorg: betere zorg. Rapport van de Commissie modernisering curatieve zorg [Shared care: improved care. Report of the Committee modernising curative care] Gravenhage: Sdu Publisher's; 1994. National Council for Public Health, National Board for Hospital Facilities. Transmurale somatische zorg. Advies van de Nationale Raad voor de Volksgezondheid en het College voor ziekenhuisvoorzieningen [Integrated and continuing somatic care. Advice of the National Council for Public Health and the National board for hospital facilities] Zoetermeer: NRV; 1995. Raak, A van; Jongerius-de Gier, G; Massop, J; Mur-Veeman, I. Brug tussen gisteren en morgen. Zorgvernieuwing als veranderingsstrategie voor een betere zorg in de toekomst. Evaluatie ‘Programma Zorgvernieuwingsprojecten Thuiszorg van WVC’. Eindrapportage [Bridge between yesterday and tomorrow. Innovative care as change strategy to achieve improved care in future. Evaluation ‘Programme Innovative care projects on primary care by WVC’. Final report]. Maastricht: Rijksuniversiteit Limburg; 1993. Spreeuwenberg C. (Net)werken voor chronisch zieken [(Net)works for chronically ill]. Maastricht: Rijksuniversiteit Limburg; 1994. (Inaugural lecture). Spreeuwenberg C. ‘Disease management’: primaire taak van verzekeraars of van zorgverleners? [‘Disease management’: principal matter of insurers or providers?]. 77. TSG: Tijdschrift voor Gezondheidswetenschappen; 1999. p. 42-4. Bodenheimer T. The American health care system. Physicians and the changing medical marketplace. New England Journal of Medicine 1999; 340:584-8. Bodenheimer T. Disease management – promises and pitfalls. The New England Journal of Medicine 1999; 340:1201-5. Richards T. Disease management in Europe. British Medical Journal 1998; 317:426-7. Hunter DJ. Disease management: has it a future?. British Medical Journal 2000; 320:530. Wagner EH. The role of patient care teams in chronic disease management. British Medical Journal 2000; 320:569-72. Yin RK. Case Study Research. Design and Methods. 2nd ed. London: SAGE Publications; 1994. Eijkelberg I, Mur-Veeman IM. Veranderingsprocessen in de transmurale zorg [Change processes in shared care].In: Spreeuwenberg, C; Pop, P; Beusmans, GHMI; Winkens, RAG; Zutphen, H van, editors. Handboek transmurale zorg [Reference book on integrated care]. Maarssen: Elsevier gezondheidszorg; 2000. p. 37-66. Senge PM. The Fifth Discipline. The Art & Practice of the Learning Organization. New York: Currency Doubleday; 1990. Argyris C. On Organizational Learning. 2nd ed. Oxford: Blackwell Publishers; 1999. Argyris C, Schöon DA. Organizational Learning II. Theory, Method, and Practice. Reading, MA: Addison-Wesley; 1996. Davies HTO, Nutley SM. Developing learning organisations in the new NHS. British Medical Journal 2000; 320:998-1001. Lieverdink H. Collectieve besluiten, belangen en wetgeving. De totstandkoming van tarieven voor medisch specialisten in Nederland tussen 1986 en 1992 [Collective decisions, interests and legislation. The development of fees for medical specialists in the Netherlands between 1986 and 1992]. Maastricht: Datawyse; 1999. p. 17-34. (Thesis). Laumann EO, Knoke D. The organizational state. Social choice in national policy domains. Madison: The University of Wisconsin Press; 1987. p. 20. Baksi AK. From past experiences to the promotion of current resources. Patient Education and Counseling 1995; 26:235-8. Coles C. Educating the health care team. Patient Education and Counseling 1995; 26:239-44. Association of Dutch Health Insurers. 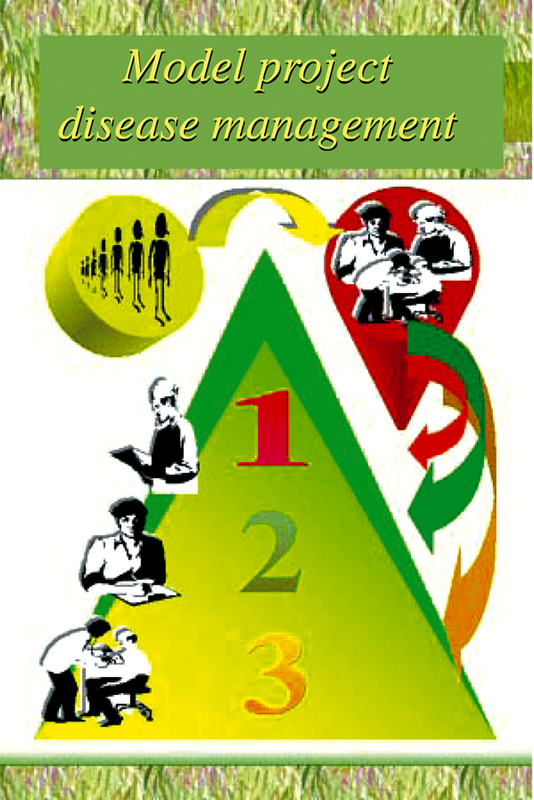 Zorgverzekeraars en disease management [Insurers and disease management] ZN, Zeist: 1998. Spreeuwenberg C, Eijkelberg I. Keuzen, knelpunten en dilemma's in de zorg [Options, bottlenecks and dilemmas in the care delivery].In: Bos, GAM van den; Danner, SA; Haan, RJ de; Schadé, E, editors. Chronisch zieken en gezondheidszorg [Chronically ill and health care]. Maarssen: Elsevier gezondheidszorg; 2000. Raak, A van; Paulus, A; Mur-Veeman, I. Transmurale zorg organiseren: eerst weten, dan doen [Organising integrated care: knowing first, acting next]. ZM magazine 1999; 2:2-6. Spreeuwenberg C, Schrijvers AJP. Heuvel, WJA van den; Jonkers-Kuiper, LV; Mootz, M; Spreeuwenberg, C, editors. Van project tot overdracht [From project to dissemination]. Interveniëren in de determinanten van gezondheid: over obstakels en leermomenten [Intervening in health care: about obstacles and learning moments] Assen: Van Gorcum; 1995. Spreeuwenberg C, Eijkelberg I. European Healthcare Management Association. Managing healthcare across public-private boundaries. Book of abstracts. Dublin: EHMA; 1999. Shared care models for chronically ill patients: the impact of private and public factors. Garside P. The learning organisation: a necessary setting for improving care?. Quality in Health Care 1999; 8:211. Martensen A, Dahlgaard JJ. Strategy and planning for innovation management – supported by creative and learning organisations. International Journal of Quality & Reliability Management 1999; 16(9):878-91. Raak, A van; Mur-Veeman, I; Paulus, A. Understanding the feasibility of integrated care: a rival viewpoint on the influence of actions and the institutional context. International Journal of Health Planning and Management 1999; 14:235-48. Raak, A van; Paulus, A; Merode, F van; Mur-Veeman, I. Integrated care management: applying control theory to networks. Journal of Management in Medicine 1999; 13(6):390-404. Hunter DJ, Fairfield G. Managed care: disease management. British Medical Journal 1997; 315:50-3. Rogers EM. Diffusion of innovations. 4th ed. New York: The Free Press; 1995. 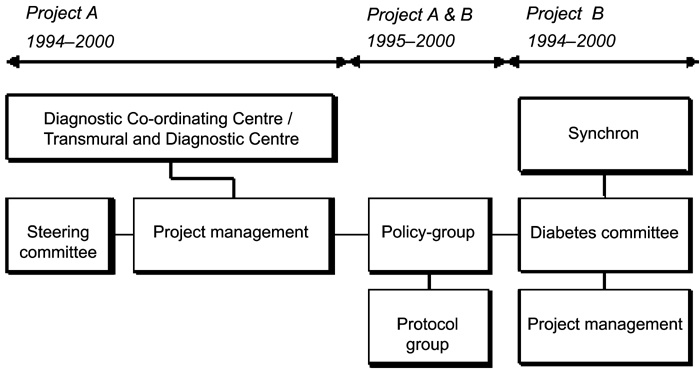 Formal project structure of projects A and B from 1994–2000. 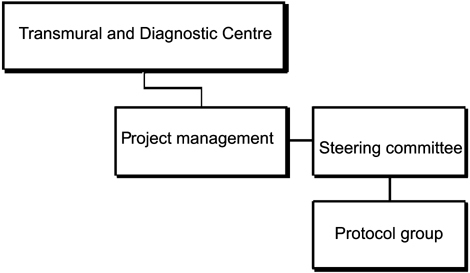 Formal project structure of the disease management diabetes project from 1999–2000. Adapted model of critical influencing factors in shared care projects.